AP/AC/AX Series auto levels are easy to set up and use All three models can attach to both flat-head and spherical-head tripods. Horizontal tangent knobs with an unlimited range ensure smooth, precise pointing and angular measurement, and you can operate them with either hand. The detachable eyepiece lens lets you use an optional diagonal eyepiece prism for working in extremely close or steep quarters. Nikon optics effectively let in more light, so you see brighter, sharper images-especially in low-light conditions. 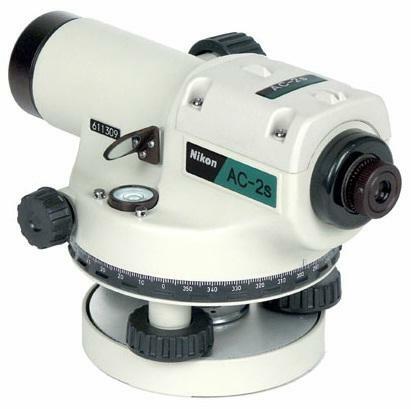 The AP-8 model auto level features a 28x high-magnification telescope, the AC-2S has a 24x telescope, and the AX-2S has a 20x telescope. All three models offer minimum focusing down to 2.46 ft (0.75 m) for better performance in tight spots or on steep slopes.